This is a reducing price auction, meaning the price drops until you or another bidder clicks ‘Buy’. If there any eskies left the price on the clock starts again just a bit above the last buy price. The price continues to drop until all the eskies are sold or the fisherment’s reserve is reached. If you sign in before the auction starts, you will see a countdown to when the auction begins. Once the auction time is reached, the first lot is automatically started and you will see a picture and description of the 1st lot appear in the top left of the screen. The clock displays the Start Price and the Current Price, both in AUD$. When the auction starts you will see the red dot move around the clock. Each revolution of the clock represents $1 and each dot repesents 1 cent. The auction starts at the starting price. In this example the starting price is $25.00 and the price has dropped to $23.65 have a look at the red dot: it's pointing to 65. The red dot travels around the clock as the price reduces and represents the cents of the current price. Next to the clock is the auction listing. This shows you the lots that are coming up. Before the auction or even during the auction you can enter pre-bids. From the example if you wanted to buy the full lot of 5 cases at the current price of $15.50 per kg you would click the '5' button (maximum bid). 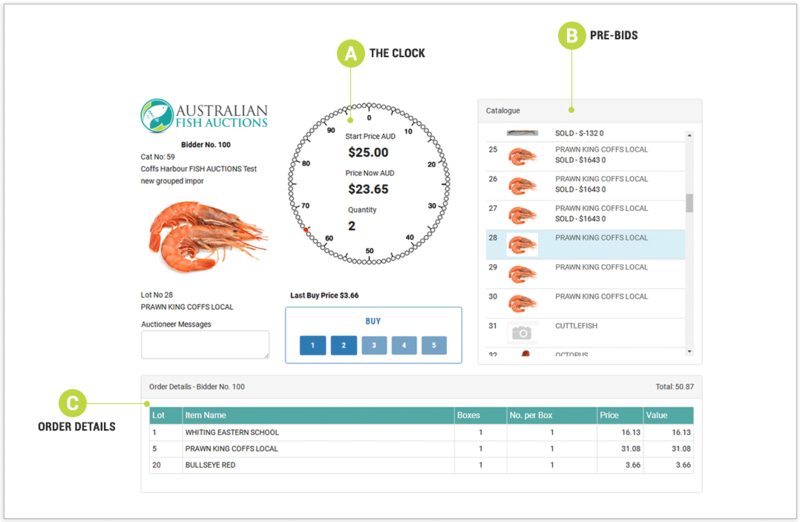 As soon as you buy the clock will stop whilst your order is processed and will then re-start at a price a little higher than before if there is any quantity left to sell. Let's say you wanted to buy 5 eskies. Click the 5 button in the Buy area of the screen. You can also pre-set your buy quantity in which case your quantity will appear in a green button.